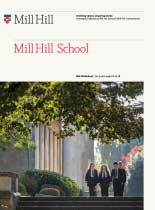 The Mill Hill School Foundation offers education to boys and girls aged between 3 and 18 in its four schools. The schools occupy over 150 acres of grounds just 10 miles from Central London and within easy reach of Heathrow, Gatwick, Stansted and Luton Airports, motorways, bus, underground and rail links. For those interested in the Schools’ Competition Act Settlement Trust consultation and on nominations for the appointment of trustees please consult the OFT website.